My wife and I saw Baba for the first time in August 1969; we had accompanied our parents: Baba materialized a beautiful necklace for my wife and asked her to wear it; He said that He had performed our marriage afresh and gave the necklace as a present to mark the occasion! Then He materialized a big apple and asked my wife to eat it! My wife had a most thrilling experience. Two important events brought about a qualitative change in my perception of Baba as God and Avatar. Very often I would wonder whether miracles were the only hallmark of divinity and whether the importance being given to them was disproportionate. One day, when my father had come to Mumbai, he told me how Baba compared His miracles to visiting cards, and that the miracles are only an introduction to Him. Then, around the year 1973, there was a fierce controversy on whether Baba was God or not. 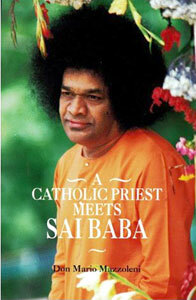 When some of the rationalists asked Baba whether He was God, He said, “I am God, you are also God. The only difference between you and Me is, I am aware of My Divinity, whereas you are not.” This struck a deep chord within me. However, it was the subsequent events which proved to be the turning points. Baba blessed my wife in the mid-seventies that she would conceive and give birth to a son. These words proved to be benedictory and my wife gave birth to a son in September 1975. Another incident which also took place in the mid-seventies further consolidated my belief. My mother was extremely unwell and my wife and I came down from New Delhi to Bangalore to look after her. She was suffering from severe pleurisy and the doctors had, on the basis of X-ray reports, opined that she would survive only for three months. When the subject was broached with Baba, He gave her vibhuti and said that everything would be all right, and that no operation would be necessary. When the X-ray was taken again, the doctors said that the danger was no longer there. My mother lived for 18 long years thereafter! These events were the landmarks of the first stage of my understanding of Baba. The miracles that He performed and the benefits that accrued to us because of them thus played an important role in convincing me about His divinity and avatarhood, at this stage. The second stage of my understanding of Baba is related to the statement that Baba makes very often. He says that He gives us what we want; so that we may want what He has come to I give us. I started pondering over the significance of the pronouncement. 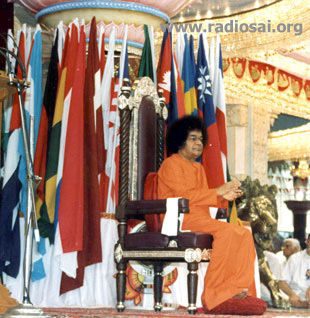 I began to feel that I should at least try to understand closely the working of the Sathya Sai organisations without necessarily being a full time or active participant in their programmes. Activities connected with Bal Vikas and Seva Dal now fascinated me. I could see the impact that these activities were having on the masses. I realised, in particular, Baba's abilities to explain to the masses the most profound truths in the simplest of words. In simple language He explains the importance of inner faith as opposed to external rituals; the values of Sathya, Dharma, Shanti, Prema and Ahimsa, as against the irrelevance of caste and creed. He is quite contemporaneous in His vocabulary as well as content. While emphasising the importance of inner faith and character, He gives the example of the car: the car moves only when the driver is able to move the inner wheel. The inner character and strength are to the human being what the inner wheel is to the car. Baba has said, “I am Lokanath (Lord of the World) and not Vyakthinath (Lord of Individuals)” I started feeling that His role as Lokanath was like that of the saints and prophets in the fifteenth, sixteenth and seventeenth centuries who mingled and communicated with the masses to awaken their interest in spirituality. My perception of Baba as Lokanath was particularly strong between the mid-seventies and the eighties. The establishment in the early eighties of Sathya Sai Institute of Higher Learning, a deemed university, added a new dimension to my perception of Baba as Lokanath. The weightage given to human values in the syllabus and the emphasis on transforming the personality of the students, not just imparting information and knowledge to them, sent an unequivocal message. He is truly Lokanath! 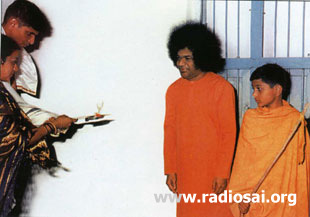 From the year 1990 onwards, a new dimension appeared in my perception and understanding of Baba as Lokanath when Bhagavan Baba undertook massive projects such as the Sri Sathya Sai Super-specialty Hospital to cater to the medical needs of the people in rural areas, and the Drinking Water Supply Project for the drought prone region of Anantapur District. Baba extended the scope of the water supply project and has covered Mahaboobnagar and Medak Districts and also Chennai City under similar schemes. East Godavari and West Godavari Districts are also being covered under similar schemes now. Such schemes have not been taken up on such a large scale by any Non-Governmental Organisations in the country. The compassion shown by Baba to the poor is unparalleled. This made me feel that Baba had come to serve Daridranarayana, the poorest of the poor. Between the years 1996 and 2000 another remarkable change occurred in my understanding of Baba's role as an avatar. I was posted as Secretary to the Department of Telecommunications, Government of India, in November 1996 and held that post till August 1998. I could experience first-hand the sweeping changes which were taking place all over the world due to the advance in telecommunications, and information technology which enabled people from different parts of the world to communicate much better with one another: however, the mindset of the human beings had not changed. There is only one caste, the caste of humanity; there is only one religion, the religion of love; there is only one language, the language of the heart; and there is only one God, He is omnipresent. I would regard this as the third stage of my understanding of Baba, in which Baba`s global approach to the question of spirituality unfolded itself vividly and intensely to me. 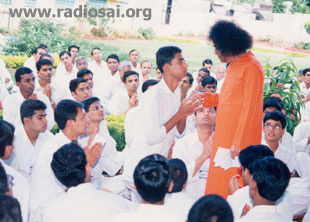 On my retirement in August 2000, I continued reading the Sai literature. The attack on the World Trade Centre in September 2001 and the events that followed thereafter shook the whole world. Like many other friends of mine, I too brooded on the problems of terrorism and fundamentalism that show signs of ascendancy today and wondered what the solution to the problem could be. In addition, as many have pointed out, whatever the degree to which they have divided humankind, the world's major religions - Western Christianity, Orthodoxy, Hinduism, Buddhism, Islam, Confucianism, Taoism, and Judaism - all share key values in common. If humans are ever to develop a universal civilization, it will emerge gradually through the exploration and expansion of these commonalities. This approach is conducive to world unity as it recognizes the underlying unity among all religions while respecting their diversities at the same time. The philosophy based on the pluralism is superior to the other philosophies based on exclusivism and inclusivism. Exclusivism, the idea that one's own way is the only true way may not be trivial as deep belief is central to any religious faith; however, if this logic is extended it means that all other religions are false and cannot be tolerated - the implications of this for humanity are dangerous. Inclusivism, the idea that there should be a single world religion or that one's own religion is sufficiently comprehensive to accommodate all others is also not workable as it does not respect diversities among the world religions. All religions are deeply rooted in the respective geographies. A Muslim can never dissociate himself from Mecca nor can a Hindu from the Ganges. At this stage, I realised that Baba, unlike the professors and intellectuals, does not merely theorize; He translates His ideas into action by setting an example. Like a magnet He attracts people belonging to different faiths from different parts of the World. His is the philosophy of pluralism based on equal respect for all religions as exemplified in the Sarva Dharma emblem. He wants all to follow their own religions and makes them better Hindus, better Christians, better Muslims, better Jews, better Buddhists, and better Jains. As the author of the book in question, I reaffirm that I have not lost my Catholic faith. On the contrary, after my encounter with the great “Indian Master” Sri Sathya Sai Baba, I feel that I live it with greater intensity in a spirit of real communion with all other religions. These all share the one goal of reaching the same and the only God, who transcends all changing names and forms. The experience of the Catholic priest from Italy is indeed a moving one. It shows how he accepted the essence of Baba's teachings despite the heavy price he had to pay for such acceptance. It convinced me that Baba alone can save the world from a major catastrophe like the one that occurred in September 2001. This, I would say, marks the fourth stage of my understanding of Baba. I have tried to delineate the four stages of my developing perception of the Sai Avatar. The more I see of Him, the more I feel and experience His inexplicability, and His 'Holy Dread'. I pray to Baba to give me greater insight and strength to understand Him and the complex cosmic phenomenon that He is. Sri Anil V Gokak, a retired Officer of the Indian Administrative Service (Maharashtra cadre), is the Vice Chancellor of the Sri Sathya Sai Institute of Higher Learning. He had held important positions in the Government of Maharashtra and later in the Government of India in various capacities such as Secretary, Department of Telecommunications; Secretary, Department of Fertilizers.